This famous wizarding family from a series of fantasy novels by J. K. Rowling is known for their red hair, money misfortunes and goodwill towards half-blood wizards and Muggles. The family made the Sacred Twenty-Eight, a list which comprised families that did not intermarry with muggles. However, they bewailed their inclusion in this list since, as they said they had connections with Muggles and were proud of it. Because of that fact, the Weasley family gained disapproval of the pure-blood doctrine advocates and were dubbed blood traitors. The family is not exceptionally well-off financially, and we know from the books that on numerous occasions their deposit at wizards’ bank Gringotts consisted of only a single galleon and a bunch of sickles. All generations in the Weasley family had large numbers of children, which was met with disapproval by many elitist pureblood families. Besides that, for several generations children from the Weasley family have been male. This trend terminated only in 1981 with the birth of Ginny Weasley, and the latest generation included more girls than boys. Let’s take a closer look at this wonderful family and learn a bit more about its members. Arthur Weasley was born into a family of pure-blood wizards. His parents were Septimus and Cedrella Weasley (formerly Black). Since the Weasley were considered a family of blood traitors, Cedrella’s marriage to Arthur caused her to be burnt out from the Black family. From 1970 to 1996 Arthur headed the Misuse of Muggle Artefacts office which let him explore the non-magical world. As of 1996 was the head of the Office for the Detection and Confiscation of Counterfeit Defensive Spells and Protective Objects. He was especially passionate about collecting electric plugs and batteries. Arthur also was a secret member of the Order of Phoenix. Molly Weasley (formerly Prewett) eloped with Arthur and settled in Burrow, an old, dilapidated house outside of Ottery St Catchpole. Though known as a loving mother and wife, she was never one to be fooled with, as she proved once and for all in a fierce duel with Bellatrix Lestrange. Arthur and Molly had seven children – William, Charles, Percy, Fred, George, Ronald, and Ginevra. William “Bill” Weasley is the oldest child. He was a high achiever at Hogwarts and thus set the bar high for other children in the family. After graduation from Hogwarts, he became a Curse-Breaker for Gringotts in Egypt. In 1995, he came back to England and joined the Order of the Phoenix. During this time, he was dating Fleur Delacour and married her in August 1997. During the Battle of the Lightning-Struck Tower, Bill got his face scarred by the werewolf Fenrir Greyback. However he didn’t turn into a werewolf, just got a craving for rare steaks. Fleur Delacour was a student of Beauxbatons Academy of Magic and represented it in the 1994 Triwizard Tournament. Just like her husband, she was a member of the Order of the Phoenix. She took part in the Battle of Hogwarts and was awarded bravery medals by both the British and French Ministries of Magic. Bill and Fleur had three children, Victoire, Dominique, and Louis. Charles Weasley was an exceptional Seeker and was chosen the Gryffindor Quidditch team captain. Charles worked as a dragonologist in Romania. He is fascinated by magical creatures and rather preferred studying dragons to having romantic relationships, so he never got married and didn’t have children. Percy Weasley can be called the most ambitious of all Weasley children since he dreamt of becoming the Minister of Magic. He graduated from Hogwarts with excellent grades and started his career at the Ministry of Magic in the Department of International Magical Cooperation. Percy’s ambitions caused a split between him and his family but he got back on to his family’s side during the Battle of Hogwarts. Very little is known about Percy’s wife Audrey. It is not known whether she worked at the Ministry or not. However, we may rest assured that she knew all their regulations and rules in detail due to her husband’s meticulousness. Percy and Audrey have two daughters: Molly and Lucy. Fred and George Weasley are twin brothers and both are known as Troublemakers-in-Chief since they liked pranks and inventing trick sweets. Shortly before graduation they decided to leave school and created the Weasleys’ Wizard Wheezes (aka Weasley & Weasley) joke shop. Both brothers were Beaters for the Gryffindor Quidditch team. Tragically, Fred was killed at the Battle of Hogwarts, which left his family devastated. Just like his twin brother, George is a member of the Order of the Phoenix and took part in the Battle of the Seven Potters and the Battle of Hogwarts. While being on a mission for the Order of Phoenix, George lost his ear in a battle, only to joke that he felt saint-like (or “holey”). After the end of the Second Wizarding War, George married Angelina Johnson. Angelina Johnson played Quidditch as a Chaser for the Gryffindor team and during her last year at Hogwarts she was made the team’s captain. She was a member of the resistance group called “Dumbledore’s Army”. Angelina and George had two children, a son named Fred, in honor of his twin brother Fred, and a daughter named Roxanne. Ronald Weasley is the youngest son of Arthur and Molly. Ron was sorted into the Gryffindor House and often felt outshined by his elder successful brothers. Fortunately, his fears proved to be groundless. He was a very skilled Wizard’s Chess player and succeeded as a Quidditch Keeper. He was also appointed a Gryffindor prefect. Together with friends Harry and Hermione he fought in countless battles of the Second Wizarding War and overcame many challenges. Ron eventually married Hermione and had two children, Rose and Hugo Granger-Weasley. Hermione Granger was born in a Muggle family. She was gifted in almost all subjects and was one of the finest minds to ever attend Hogwarts. She played a crucial role in many battles of the Second Wizarding War. After the war, she married Ron Weasley and eventually became the Minister of Magic. Ginevra Weasley was the first girl to be born in the Weasley lineage for several generations. She had impressive skills at playing Quidditch and was appointed a Chaser and a Seeker at different times. She also played an important role in Dumbledore’s Army and fought in many battles during the Second Wizarding War. After the war, she started her career at the Holyhead Harpies, but after marriage to Harry Potter and having children, James Sirius, Albus Severus, and Lily Luna, she was offered the position of a sports editor for the Daily Prophet. Harry Potter, the legendary “Boy Who Lived” first met the Weasley family at the King’s Cross station and quickly made friends with Ron. He was always treated as a fully-fledged member in the Weasley family. After he married Ginny this status was made official. In 2007 Harry was promoted to the Head of the Auror Office and would occasionally give Defence Against the Dark Arts lectures at Hogwarts. 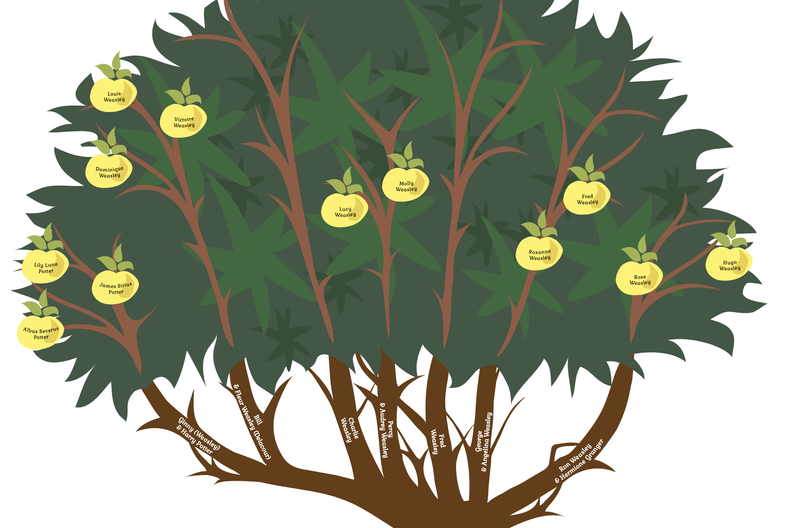 Weasleys have a truly exciting family tree, don’t they? What if your family is no less interesting? Let’s check that! 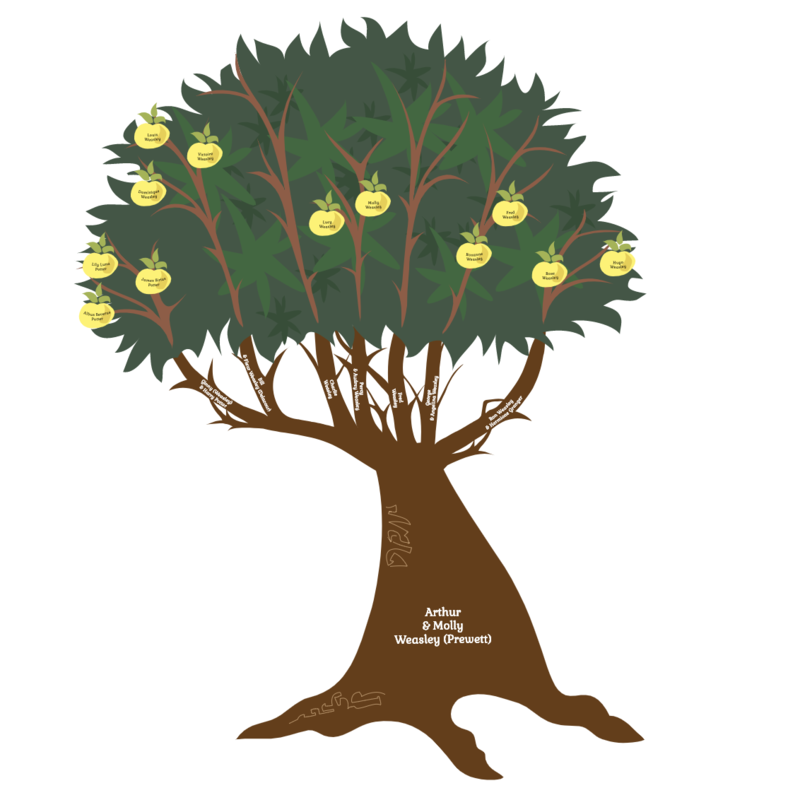 Make your own family tree using our building tool and share your personal story with friends and relatives!